What is Neuroendocrine Tumours (NETs)? Neuroendocrine tumours (NETs) are when malignant cancer cells form in the neuroendocrine system. This is a network of glands and nerve cells that produce and release hormones into the bloodstream to control how our bodies function normally. Neuroendocrine cells can be found in most organs of the body. For example, neuroendocrine cells in the stomach help release fluids that aid digestion. NETs are sometimes referred to as carcinoid tumours and grow at different rates. They are usually slow growing tumours, but NET growth can also be aggressive and spread to other parts of the body. The location of the tumour can be added to the NET terminology, such as pancreatic NET (PNET) and lung NET. The most common sites for NETs to form are the digestive system and the lungs. The gastro-intestinal tract accounts for 54.1% cases. Gastro-intestinal tract NETs are usually found in the large bowel and appendix (23.3%), small intestine (20.6%), pancreas (6.5%) and stomach (3.7%). NETs can also develop in the lungs (25.9%). The type of symptoms caused by NETs can be different depending on the location of the tumour. For example, intestinal NETs cause diarrhoea compared to bronchial (lung) NETs that can cause wheezing. Early stages of NETs often do not cause any symptoms or only show in the form of non-specific symptoms, which can be commonly found in other illnesses. In some instances, NETs can cause an overproduction of hormones, which causes carcinoid syndrome. 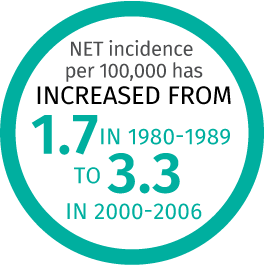 NET is considered a rare cancer, but incidence has increased in Australia over the past few decades. Analysis has shown that annual NET incidence per 100,000 has increased from 1.7 in 1980-1989 to 3.3 in 2000-2006 (that is, three people per 100,000). NETs are now considered the second most common gastro-intestinal tumour after colorectal cancer. The five-year survival rate is at 68.6% for all NET sites. However, the median survival rate for advanced NET cases can vary greatly depending on the tumour’s location.  Patients with small bowel NETs are estimated to have a median survival of 12.5 years. Pre-existing stomach conditions such as a peptic ulcer. Tests to diagnose NETs will vary depending on patient symptoms and location of the tumour. They include blood tests to check for biochemical markers, imaging scans and biopsies. NET diagnosis is often difficult as the tumours are often very small and can occur anywhere in the body. In addition, some NET symptoms are often non-specific and can be misdiagnosed by medical practitioners for common illnesses. On average, it may take 4 to 7 years for a diagnosis. A blood test will check for general health, which includes normal hormone levels, liver and kidney function. A blood test will also check for tumour markers such as CgA, which is a type of protein released by neuroendocrine cells. When there are high levels of CgA in the bloodstream it may be a sign that NETs are present in the body. Very high levels of CgA are rarely found outside the possibility of NETs. Other blood markers, including serotonin level and plasma/urine 5-HIAA levels, may be used for diagnosis. If there is a strong suspicion of a gastro-intestinal NET, an endoscopy allows the doctor to examine the upper digestive tract and inside of the stomach by using a thin flexible tube with a camera. During the procedure, the doctor may also take a small sample of tissue (biopsy) to examine under a microscope to see if there are any cancer cells. Biopsy examinations can include testing for signs of CgA in the tissue sample. The doctor can also confirm a diagnosis using detailed imaging scans to see if there is any evidence of NETs. This can include computed tomography and fluoro-deoxy-glucose positron emission tomography (CT/FDG-PET scans) or functional PET scan (Gallium Ga-68 DOTATATE) or Magnetic Resonance Imaging (MRI). NET treatment depends on the size, location of the tumour, and how well or poorly differentiated the tumour is as well as whether the cancer has presented at an advanced stage or has spread. Treatment options include surgery to manage the tumour, as well as medical therapies, such as somatostatin analogues, to alleviate symptoms caused by NETs. Currently, surgery is the only effective curative treatment option for NETs, especially if the tumour is in one location. If the NET has not spread outside the organ or area where it started, the tumour can be completely removed leaving behind healthy tissue. In this situation, the surgery can potentially cure the cancer and no follow-up treatment is necessary. If the tumour is too large to remove completely, surgery may be performed to make the tumour smaller to prevent it from affecting surrounding organs. Daily or monthly injections of somatostatin analogues (that is, a manufactured version of the naturally occurring somatostatin) can stop overproduction of hormones in the human body. Somatostatin, a hormone that is produced in the brain and digestive tract, usually helps regulate the release of other hormones. The injections can control symptoms such as flushing and diarrhoea. There is also evidence that somatostatin analogues can slow down the rate of growth of tumours. Other possible treatments depend on the location of the tumour. There are currently biological therapies (including Sunitinib and Everolimus) for individuals with pancreatic-NET which aim to slow down NET growth. If the NET has spread to the liver, there is an option of hepatic artery embolisation, which involves direct injection of a chemotherapy drug (chemo-embolisation) or radioactive particles (90-Y radio-embolisation) into the hepatic artery to block blood supply to the tumours in the liver. Chemotherapy and radiotherapy may also be recommended when the NET continues to grow and spread, despite surgery and other medical therapies. There is currently no known routine screening service available for NETs in Australia. As the current known risk factors of NETs are genetic syndromes there are no known protective methods to reduce the likelihood of developing NETs.